Grab a ticket to the GEICO 500 in Talladega on April 28 and a Braves game in 2019 for only $80! The Biggest Baddest TRACK in NASCAR is teaming up with the Atlanta Braves to offer you a special ticket package that includes both a ticket to the Talladega Superspeedway GEICO 500 on Sunday, April 28, plus a ticket to a Braves game in 2019! The package includes a reserved seat in the Lincoln Grandstand near Turn 4 for the GEICO 500 in Talladega. In addition, you will also receive a Home Run Porch ticket for one of the seven Braves games listed below. The Braves tickets are based on availability, so lock in your seats early to get your preferred game date. To secure your Talladega/Braves ticket package, select Buy Now for the Braves game you want to attend from the list below, and it'll automatically prompt you to select your race ticket on the next screen. After you purchase the ticket package, be on the lookout for an email from Talladega Superspeedway that will include your PDF Print at Home Ticket for the GEICO 500. The Braves ticket is mobile, and can be accessed via your smartphone by logging in at braves.com/myaccount with your email address. 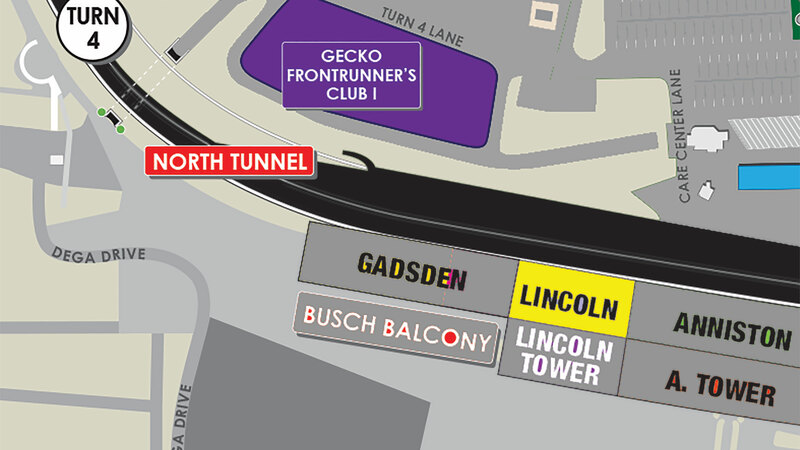 Your GEICO 500 ticket is for the Lincoln Grandstand shown above in yellow. If you have any issues accessing your GEICO 500 ticket, please contact the Talladega Superspeedway at 855-518-RACE (7223).